One of the USPs of Pardot is the ability to track campaign ROI by generating the Velocity Chart, which shows average conversion times, and the Lifecycle Funnel Report. If data is managed well and Salesforce opportunities are used as intended, these reports will always be automatically updated. However, it’s a question of the data being accurately updated. I’ve put together this quick Pardot tutorial for managing data between Pardot and Salesforce because it’s not always the case that the reports I’ve mentioned accurately reflect the true scenario. If contact roles are not being assigned to opportunities within Salesforce, or data is being uploaded to Salesforce in the first instance instead of Pardot, you may encounter inaccuracies. I find that the latter is a more common scenario. Manage your data well though and your marketing teams will have a much easier time with reporting. 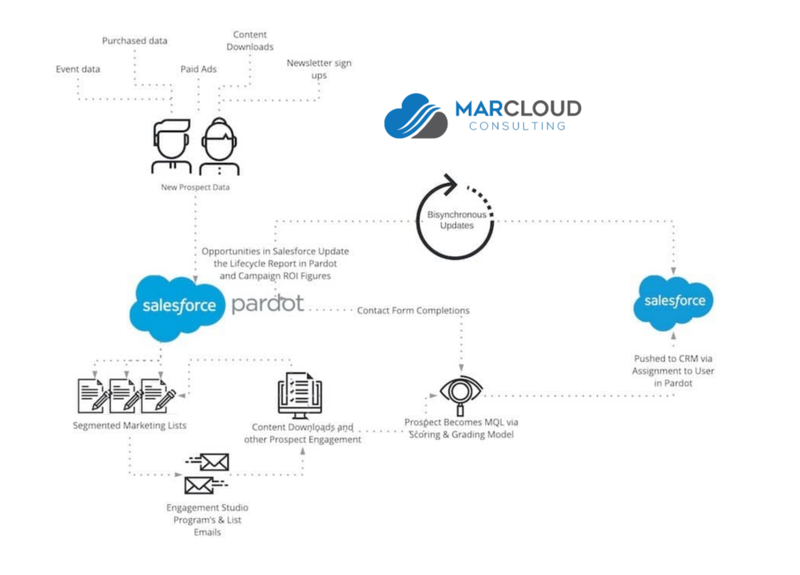 To extract the most value from the Pardot-Salesforce relationship, you’ll need to understand how the two systems were designed to work together. First off, Pardot should be considered the entry point for all new, unqualified data. This might completely go against your current process, but there’s a good reason for it. By uploading data straight into Pardot, it becomes the unqualified nurturing hub of your marketing operations. Naturally, Salesforce will then become the qualified nurturing hub that’s filled with leads that are ready for sales to convert. To help clarify what I’m trying to say, I’ve drawn up a diagram below. It’s an easy rule to go by once you start adopting this process. But what if they’re already qualified and need to go straight to sales? This should be built into your automated lead distribution. For example, if you want to instantly qualify prospects who complete your ‘contact us’ form, then build this into your automation. This might be ‘Profile is X and Score is above 100’, so set their profile and allocate 100 points as a completed action then the prospect will instantly be assigned and sent to Salesforce with an assigned user. Nurture your prospects in Pardot to ensure that you’re well aligned with your sales team and they’re only given marketing qualified leads to convert. Combine an Engagement Program with a smart lead qualification process prior to sending to Salesforce for them to work. Uploading your data straight into Salesforce can overwhelm sales and make it much more difficult for them to prioritise the hottest leads. Grow, then show. One of the most powerful aspects of Pardot and Salesforce is the bisynchronous link between the two. Once a Lead in Salesforce is converted to a Contact and subsequently assigned as a Contact Role to an Opportunity, this then feeds back to Pardot and updates the Lifecycle Report as an SQL. Once the deal is won, the Lifecycle report is updated again and more importantly, the value is fed back to the campaign the prospect is associated to in Pardot so that an ROI figure can be generated. This is game changing for your decision making process as it enables you to let the data help you make marketing decisions going forward and justify new campaigns with historic ROI figures. Terminology: What does it mean? Visitor An unrecognised person who has landing on a page which has your tracking code on. Prospect A prospect is a visitor with a known email address in Pardot. SQL A prospect that has been assigned to an opportunity as a contact role. Won Deals Cash money. The opportunity has been marked as closed won. I am running into an issue where my SQL numbers are quite low on the Lifecycle report in Pardot. After digging around a bit, I notice the majority of the Opportunities that exist in SFDC do NOT have prospects (contact role) assigned to them, due to user error on the part of our sales reps. I have attempted to manually add a contact role to one of the Opportunities in SFDC that is not appearing as an SQL, and it still does not appear on my report.I have also gone into the Opportunity record in Pardot and manually synced with CRM, and still not there. Do you have any advice or ideas around why this would be occurring? Thanks in advance for the helpful post and any advice you can provide! It might be worth checking the timeframe that is set on the lifecycle report because the opportunities are being updated retrospectively with the contact roles but the date the opportunity was created may be well before the window of time within the report. I would recommend picking 3 or 4 records that you updated and then checking back in with the Pardot lifecycle report again but this time amending the date window to include the date the 3 or 4 records opportunities were created. If all is well, the SQL’s will appear and you can click the blue hyperlinked number next to ‘SQL’ to see if those prospects are in there. Let me know if this fixes the problem!